Quick rundown: Democrats want to force Christian employers to pay for abortion and “birth control” drugs that abort a pregnancy. Many resisted. The Supreme Court sided with the employers in the “Hobby Lobby” case. 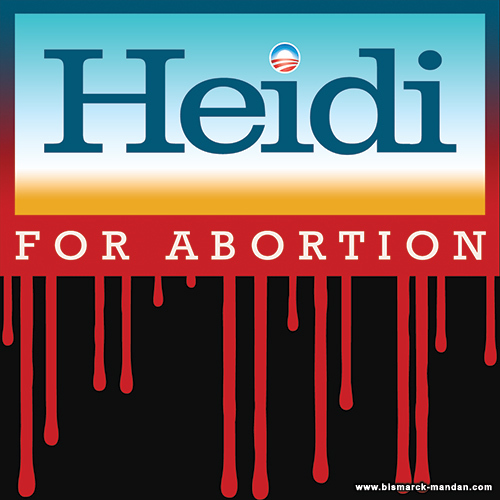 Vowing to proceed with infanticide, Heidi Heitkamp’s party decided to push through a new law to specifically counter that decision. Guess who voted “Yea” for cloture on this bill? But wait a minute! 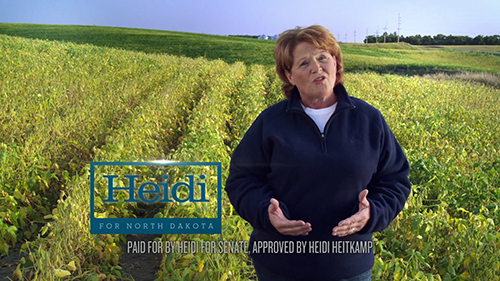 Didn’t the self-proclaimed “Independent Voice™ for North Dakotans” say in her campaign ads, “I’ll only answer to you.”? Yes, that’s exactly how she ended the ad portrayed above. That’s how she portrayed herself throughout her campaign: go check out her TV ads for yourself…they’re all online. North Dakotans oppose abortion. That’s never been arguable. We send people to our state legislature who oppose it as well (aside from pockets of Democrat party dominance). On our behalf they have passed multiple laws and resolutions defending life in the womb, and we continue to re-elect them. I think it’s pretty clear what the citizens of North Dakota, whom Heidi Heitkamp claims to represent regardless of “partisan politics”, believe on this issue. Yet she sides with her Democrat cronies consistently. In fact, she sticks with President Obama 97% of the time, and it’s been documented. Click on the image for a full size version. Download and share! 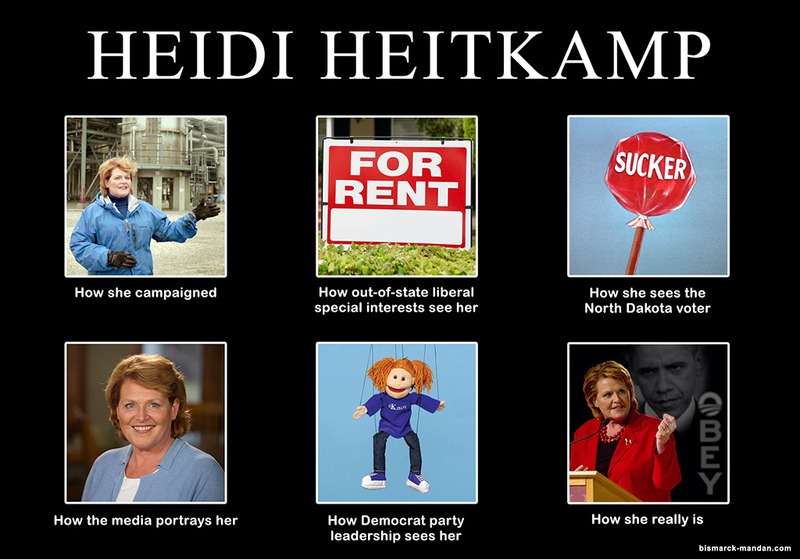 Back when the “What I really do” meme was big in the net, I was able to come up with this in a matter of minutes; Heidi makes it easy. It illustrates perfectly how the Independent Voice™ really pulls a fast one on North Dakota. Fortunately, the Republicans were able to stop the Democrats this time; the pro-abort Dems were unable to get enough votes for cloture on S2578.. They won’t give up, though, and how they’ll be shrieking about “partisan politics” and how they tried in their valiant effort for “reproductive rights™” to raise more liberal campaign donations. Business as usual. There are a lot of things Senator Hoeven does that I don’t like, but in this case I think it’s worth a trip to his Facebook page or email inbox to let him know that this was the right stand for North Dakota. Unfortunately, having a Heitkamp in the Senate means that the Democrats can effectively cancel out Senator Hoeven’s vote any time they want to. By splitting our vote, they take North Dakota out of play on any given issue. Think about that if you ever consider casting a vote for a Democrat Senator in a future election, no matter how many starry-eyed promises of independence they make. This entry was posted in Expository, Politics by Clint. Bookmark the permalink.